This package contains the Amplifier only and is designed for users who wish to pick their own external Antennas and Mounts from our large selection. 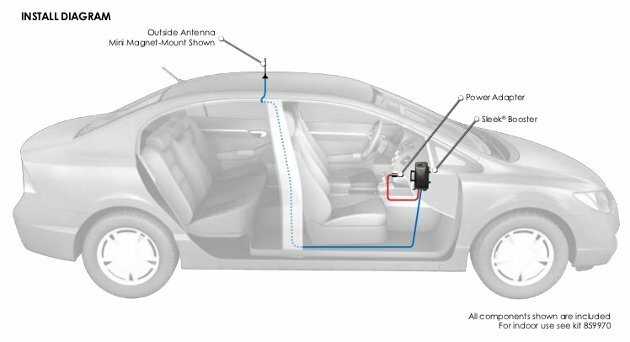 The new tri-band cradle signal booster from Wilson is a vehicle solution that amplifies cellular signals in the 1710-1755MHz and 2110-2155MHz, the 824-894MHz, and 1850-1990MHz frequency bands. It works with AT&T's 4G LTE network, Verizon, T-Mobile, and Sprint's LTE network. It also works with most 2G and 3G networks. It provides a gain of up to 40dB, delivers more than 20 times the power of a typical cell phone, and is designed to keep your cellular device connected even in weak signal areas, minimizing occurences of dropped calls and improving data transfer rates. There are three Sleek 4G models to choose from, depending on your 4G cellular provider. The Sleek 4G-A and Sleek 4G-V are designed to work on AT&T and Verizon's 4G LTE networks, respectively. The Sleek 4G-C is designed to work on 4G networks throughout Canada, as well as T-Mobile 4G in the U.S.These 4G Sleek signal boosters will improve data speeds for your devices allowing you to remain connected and enjoy a strong, reliable 4G signal. In addition to boosting 4G signal, they also boost current 2G and 3G signals used for voice and data communication, allowing you to stay connected in places you never could before. Click the button below to add the Wilson 812725 Sleek 4G-C (Canadian carriers) +26dB Tri-Band Vehicle Signal Booster **AMPLIFIER ONLY** to your wish list.